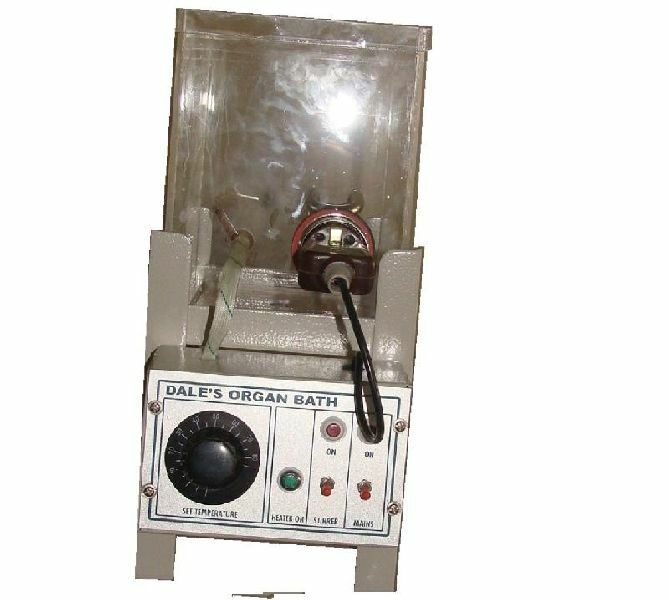 A Perspex organ bath with fine thermostatic temperature control, electronic stirrer and complete set of accessories, making it a versatile unit for all research work. Bath 9”×6”×8”, with leak proof dovetailed joints, resting in sturdy metal frame; top of the bath carries a 1”×3/8” hick band, for fixing accessories, inside the bath is a metal sheathed heating element (easily replicable) controlled by means of a fine adjustable thermostat with sensitivity ±1°c. The stirrer unit is completely independent and dips in the bath in one corner, fixing on its special stainless steel upright. A M.S. Junction box is fitted to the bath frame and carries all the electrical leads and connections two pilot lamps indicate functioning of the thermostat and stirrer.